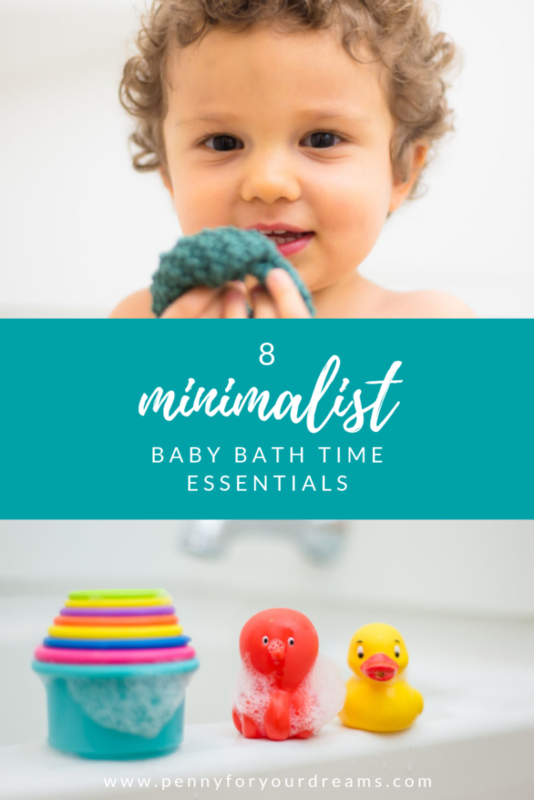 8 Minimalist Baby Bath Time Essentials | You Don't Need Much! When it comes to minimalism and babies, my motto is to have “as little as possible, but as much as necessary.” While I don’t want baby gear taking over my home, I do want to own things that will make my life easier. My minimalist baby bath checklist is fairly small, but each item has been indispensable! Being thoughtful about what I bring into our home keeps the clutter down—especially when it comes to buying larger and more expensive items. I look for things that will add value to our lives in some way, such as saving money or time, and adding beauty or convenience. When you’re pregnant with your first child, it’s hard to know which products you’ll use on the daily, and which ones will be used twice before collecting dust in the closet! It’s the nature of having a baby. You buy things and see how they work with your child and your parenting style. Some baby items become tried and true favorites, while others end up in the give-away pile. Do your research and be selective, but try not to worry about ending up with products you don’t use. It’s going to happen because it’s all about trial and error with babies! You can always declutter later. Alright, let’s jump into my minimalist baby bath time favorites! Growing up in Florida, water played a special part in my childhood. I’ve always wanted my son to love the water, too. So I strategized about the best way to accomplish that, and decided to introduce Jack to bath time by holding him in the water myself. I know—it’s risky without a diaper, but I was determined! When his tiny body first touched the water, he wasn’t entirely sure about the whole idea. But he quickly warmed up to bath time as he nursed in my arms. After a few baths together, he had his first solo bath in the Angelcare bath support—and he loved it! We bathed him in it almost every night until he was able to sit up in the tub on his own. We recently lent it to my brother and sister-in-law, and their little guy also loves it! The Angelcare bath support is very well-made and comfortable for babies. The mesh material is actually quite soft, even though it looks more like hard plastic in the stock photo. I love that you can stick it right in the tub, and don’t need an empty sink to give your baby a bath. It’s also very easy to store because it doesn’t take up much space. The Angelcare bath support stays clean, and we’ve never had an issue with mold or mildew like I’ve heard of with other baby bathtub products. I mentioned this product in my newborn must-haves post over 2 years ago, and I still highly recommend it! I recommend finding a nice set of high-quality baby bath toys that will last for years. After we found out we were pregnant, the very first thing my husband and I purchased was this set of 12 Battat bath toys. These water-themed bath buddies are just adorable! We had been holding ourselves back, waiting to buy any baby gear until we knew whether we were expecting a girl or a boy. But we just couldn’t pass these by when we saw them! They immediately made me smile, and I fell in love with the beautiful color palate and design. I could tell that they were well-made just by looking at them. Jack loves playing with these toys during every bath time, and they’ve held up great! The Battat bath toys do have holes in them for squirting water, but I actually hot-glued them shut so they wouldn’t collect mold inside. Works like a charm! This set of 8 stack up cups has got to be the best-value toy I’ve every purchased. Jack has played with these for hours on end—and they cost only $3.99! They’re one of the only toys that he’s played with from infant-hood to toddlerhood. 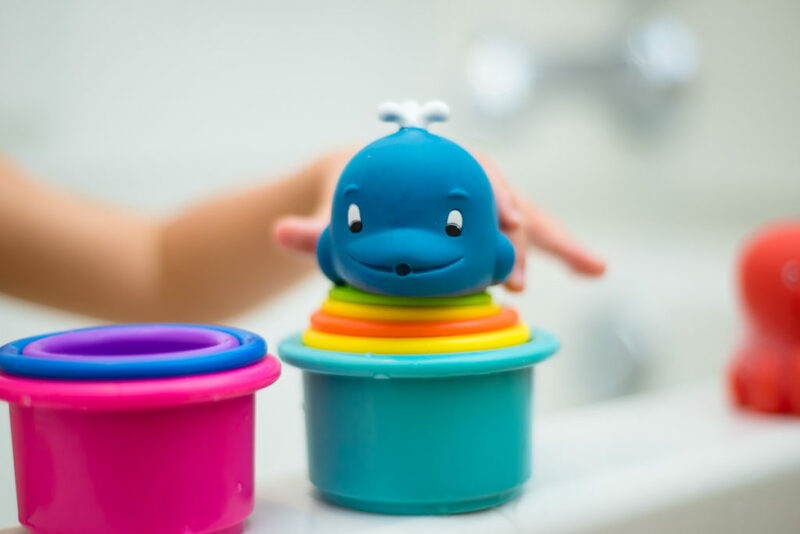 I didn’t originally have bath time in mind when I purchased these cups, but they’re really the perfect bath toy—durable, bright and colorful, and awesome for water-play. Plus, they barely take up any space. The cups hold water, but the tiny holes in the bottoms of the cups let it slowly drain, which is fun for toddlers to watch and play with. I started out with a set of Burt’s Bees organic cotton washcloths when Jack was a newborn. I love how soft and small they are! Once he got a little older, we switched to using hand knit washcloths. A friend had gifted us his first hand knit washcloth at our baby shower. I ended up loving it so much that I knitted him a second one—and I’m working on more! Etsy is the perfect place to find beautiful—even organic—handmade washcloths! You can easily match any color scheme, and there are many designs to choose from. If you knit or crochet yourself, you can whip up a few of these in no time. I love knitting quick projects—especially when they get so much love and use! If you’re looking for pattern ideas, check out Ravelry for inspiration! Currently, my favorite washcloth yarn is Cotlin from Knit Picks for its softness and durability. There are so many lovely colors to choose from! Smelling Burt’s Bees Baby Shampoo & Wash instantly brings me back to Jack’s newborn days. We’ve used it on him since birth, and I love the fresh, clean scent that lingers in his damp hair after a bath. It leaves baby skin soft and clean, and doesn’t sting their eyes. Plus, a single bottle will last you a crazy long time! 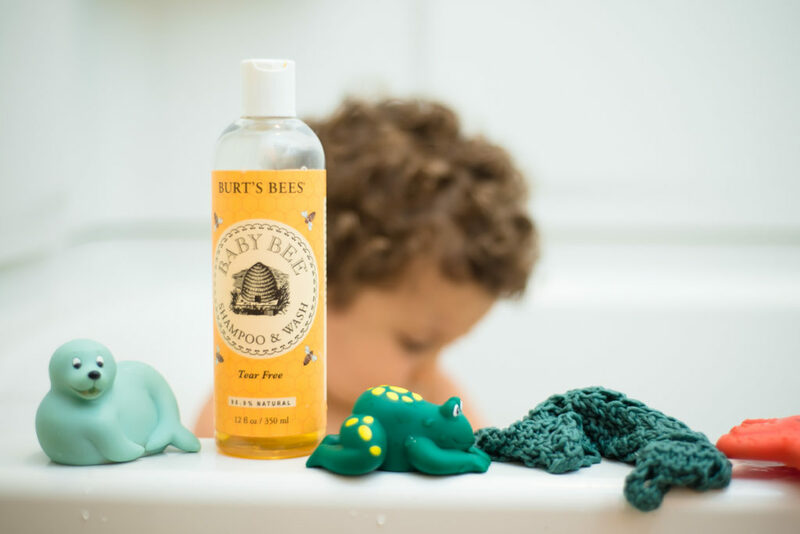 Once your baby gets a little older, the Burt’s Bees Baby Bubble Bath (try saying that 5 times fast!) is a super fun addition to bath time! We recently discovered it, and Jack is now officially obsessed with bubbles. Lavender is a very gentle, calming, and soothing oil. If bath time is an integral part of your baby’s bedtime routine, try adding just a drop or two into the tub under running water. It fills the bathroom with a lovely aroma, and helps baby wind down for the night. If you already love using essential oils, you probably have a bottle of lavender on hand. But if you need a source for high-quality, affordable essential oils, check out Eden’s Garden. I love their oils and recommend them wholeheartedly. At the first sign of redness, I’d slather some Earth Mama Baby Organic Diaper Balm on Jack’s bum. Largely because of this balm, he never once developed a diaper rash! I would often apply a little right after bath time, shortly before bedtime, and it worked wonders. The Earth Mama diaper balm is über safe and gentle—completely free of petroleum, parabens and artificial fragrance! Plus, it smells nice, and a little goes a long way. I went through two jars in Jack’s first year, and sometimes I’d even mix in a few drops of lavender essential oil. This is one product I never wanted to be without, so I just couldn’t leave it off my minimalist baby bath time checklist. Part of me would have preferred simply using a regular-sized towel that we already had on hand, but using a hooded baby bath towel turned out to be more practical. It’s much easier to dry off a tiny baby in a towel that’s more their size. They tend to get swallowed up in a regular-sized towel! I found that I only needed one baby bath towel, even doing laundry just once a week. You’re just drying off a clean baby, right? We hung Command Hooks on the back of our bathroom door so that we’d have a place to air-dry each of our towels, which works great. Bath time can be such a fun, sweet bonding time for you and your baby. Ours have been filled with so many smiles and laughs—we’ve made lots of great memories. 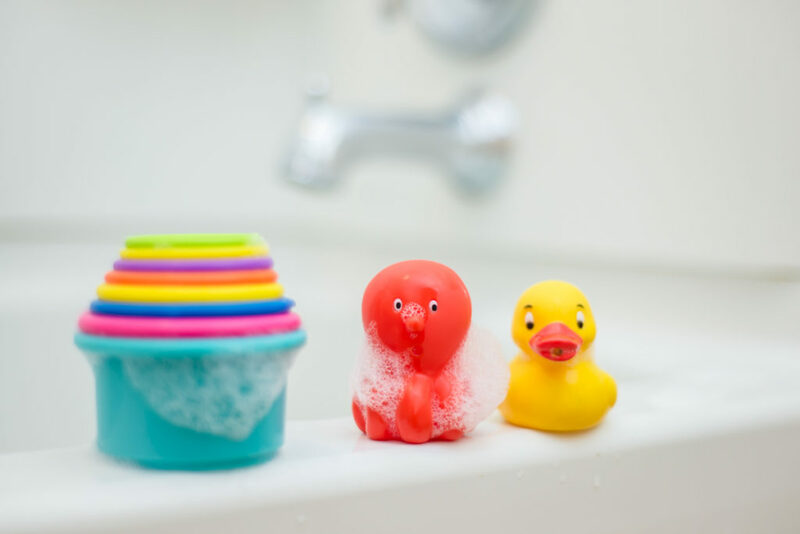 Over time, you’ll discover which bath products work best for you and your little ones. And usually, you won’t know what you love until you try some things! What are your favorite baby bath time essentials—the ones you can’t live without?